FYI- This post contains affiliate links for some of the items mentioned. referring you. 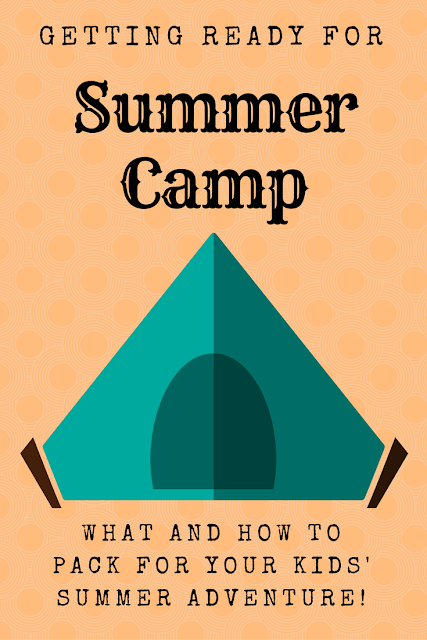 It's how I keep this blog running (and send my kids to summer camp!). Summer camp is a rite of passage. Every kid who goes to a summer camp, comes back older and wiser (or so they think!) with memories they will share with their own children someday. It's learning to survive without Mom or Dad being at their beck and call to amuse them when they are 'bored'. It's building new friendships face-to-face instead through the chat feature on a video game. It's learning to pick up after themselves for a few days with a faint hope that they'll learn to appreciate all that is done for them at home.... Can you tell I'm ready for the kids to go? All kidding aside, summer camps are great for social skill development, learning independence, and boosting self esteem in kids. It's an experience that just can't be recreated anywhere, no matter how many times we set up a tent in the backyard, make s'mores over the fire pit, and tie dye t-shirts with them. Of course, the idea of sending the kids to camp is easily converted to the reality of sending them; a few clicks of a mouse or dropping a form in the mail can get them registered for any camp you could imagine. But once they are signed up and the date draws near? This is when it gets to be a little bit more, well lets just say, involved. Packing their child's gear can bring a parent to tears. I've been there. I've had cold sweats, nausea, and migraines trying to remember if I sent everything they need with them. A rain drop falls - did I pack a raincoat or umbrella? Little Billy will catch pneumonia! A mosquito lands on my arm - I didn't send calamine lotion!!!! That bug spray isn't strong enough, and Sweet Suzie is going to scratch herself raw! Yeah, the freak-outs that only a mother away from her baby can have. But I've learned a few things over the years. The biggest lesson I've grasped is that they are tougher than we give them credit for. They could be in a monsoon, and they aren't going to put on that raingear anyway. They're going to go jump in the mud puddles and have contests to see who can get the wettest and the dirtiest. And if I forgot to pack the rain gear, they really don't care. But this list is meant for your peace of mind. Even if your child never even changes their clothes while they are at camp, at least you can feel good about sending them with what they may need. The list is for an average week (for example, a Sunday through Saturday range) at a summer sleepaway camp. The items listed here will make sure they are prepared for any situation without over packing. You can even download a printable version for easy reference! Ideally, the duffle bag will be large enough to hold everything! If it is, put the sleeping bag in the bottom end first. Everything else will fit beside it at the top end. If it isn’t large enough, simply put the sleeping bag, pillow, and any other blankets into a large size heavy duty plastic bag. When you get to camp, simply fold up the plastic bag and save it for packing up to head home! That sleeping bag is going to be dirty, trust me. Place the toiletries, shoes, and bath towels into the bag first. On top of this layer, add the pajamas and clothing, including socks and underwear. The next layer will be the beach towel, swimsuit, and sandals. Most camps require campers to take a swim test for assessing their abilities in the water. And that swim test is usually the first camp activity! Having what they need accessible at the top of the duffle bag saves them from dumping everything out right away, and gets them on their way. On top of everything, place the pillow and blanket, and zip it shut. (Skip this if you are employing the trash bag method.) You’ll be pulling out the bedding first to set up the bunk, so it may as well be right there! If the duffle bag has exterior pockets, this is where you would pack the laundry bag. It’s going to get lost within their clothing if you don’t separate it out. They’re kids. It’s how they function….. The daypack or backpack is what holds all of the extra gear, such as the flashlight, sunscreen, bug spray, and all of those goodies. Your child can carry that separately from the duffle bag, and if they have a way to hang it from the end of their bunk, it keeps all of that fun stuff organized in one convenient spot! You have now efficiently and expertly packed your child for a week away. All in one bag. Minimalistic. Organized. Including everything they absolutely need. Their return home will be much different, with all of the wet and dirty items smashed into the bag in a random mess. Most likely, it won’t all fit, because they are not yet engineers. But they survived the week because you had them start off on the right foot!